Within a 30-year span and events that occur in four countries and on three continents, Lee's fourth novel reveals the entangled histories of three protagonists. This novel, his fourth, gathers life greedily, hungrily, but with a certain stealth: Lee doesn’t bolt it all down at once, as the refugee children in his story do. 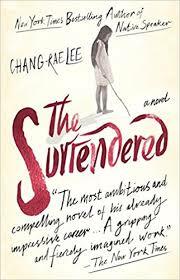 The Surrendered, his largest, most ambitious book, is about the horrors of war and the sorrows of survival, yet its manner is quiet, watchful, expectant, as if everyone, including Lee himself, were waiting to see what might accrue ... He moves back and forth in time, circling his characters, sizing them up... He shifts point of view frequently to give us some relief from his heroine’s blurred, in-and-out consciousness ...Lee invents an extraordinary number of vivid characters, many of whom prove to be just passing through on their way to violent, senseless ends ... Sentence by mournful sentence he keeps on, struggling a bit at times but constantly pushing forward, taking his characters however he can to a place where they can rest. ...a book that is commendably ambitious, extremely well written, powerfully moving in places, and, alas, utterly conventional. Here the machinery of traditional, mainstream storytelling threshes efficiently ... Many of these scenes are piercingly evoked, and the novel is so spacious in design and reach, so sensitive to historical catastrophe, that it seems churlish to bridle. Yet in the aggregate this slabbed magnificence seems, if not melodramatic, then certainly stagy, even bookish, a livid libretto, something made for the novel rather than made by it ...passage is typical both of the novel’s brilliance of prose and of its violent disclosures: Lee’s relentless, cruel calm is sometimes reminiscent of Tim O’Brien’s accounts of combat in Vietnam. Cross-cutting between the three protagonists' perspectives at different points in their lives, Lee effectively builds suspense around a series of mysteries ... The problem with The Surrendered, despite Lee's characteristically elegant prose (his first two novels entirely deserved the plaudits and praise they received), is that few of these questions are adequately answered ... During the war, carnage can multiply: June, Hector and Sylvie each survives atrocities that Lee narrates with immense power and skill; the death of Sylvie's parents is especially haunting, and alone makes the novel worth reading ...a novel almost cut off in mid-bloom by an author who hasn't kept quite vigilant enough, and surrendered a bit too easily. What did you think of The Surrendered?